Thus did painter Robert Motherwell (1915-1991) characterize his close friend, David Smith (1906-1965). Smith and Alexander Calder (1898-1976) were the great innovative American sculptors of the 20th Century. A man of titanic presence and energy, Smith lost his life at the age of 59, when he had already scrambled to dizzy artistic heights and obviously was going higher. A week before his death he refused to let two visiting youngsters ride with him on his new motorcycle. He wasn’t yet sure of himself on it. He also drove a top-heavy, canary-yellow delivery truck to haul his work and raw materials. This, not the motorcycle, crushed out his life a week later. Although Smith learned welding in a Studebaker factory at South Bend, he did not start out to be a sculptor. He wanted to be a painter. He went to Ohio University for a year and to Notre Dame for two days before moving to New York City in 1926 to study at the Art Students League. Discovering the welded sculptures of Pablo Picasso, he became interested in combining painting with sculpture. Smith and his wife bought a farm in Bolton Landing, where, in 1932, he installed a forge and anvil. He began creating sculptures with found objects — wood, scrap objects, soldered metal, coral. Soon he began using an oxyacetylene torch to cut and weld metal heads, which are thought to be the first welded metal sculptures ever made in the United States. During World War II, he worked as a welder for the American Locomotive Company. He built locomotives and M7 tanks. The war over, with prodigious energy and output he turned again to his art. Most sculptors working in metal use molds to cast their creations in bronze. This allows multiple copies. Smith welded pieces of metal together, creating unique pieces. A 1950 Guggenheim Fellowship gave him the financial freedom to move on to bigger and more expensive creations using stainless steel. He was becoming famous. His works were being read about in art magazines, talked about, and seen in museums on both sides of the Atlantic. 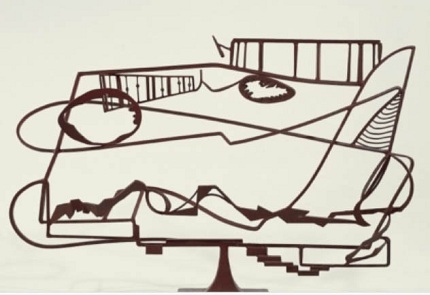 When the Italian government invited him to make sculptures for the 1962 Festival of Two Worlds in Spoleto, he was given use of an abandoned steel mill and a group of assistants. In 30 days he produced 27 pieces. Not content with this, he had tons more steel shipped from Italy to Bolton Landing, and over the next year and a half he produced 25 more. 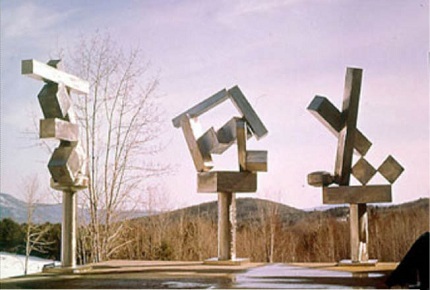 David Smith, left to right, from the Cubi series, XVIII, XVII, and XIX, 1963-64. Shortly before Smith’s fatal accident, President Lyndon B. Johnson appointed him, the only artist or sculptor selected, to the National Council of the Arts. In the 53 years that my wife and I lived in Maryland suburbs of Washington, D.C., the National Gallery of Art mounted two huge one-man sculpture retrospectives in the East Building. These represented two different centuries, two different countries, two dissimilar artists: Auguste Rodin (1840-1917), figurative, and Smith, Abstract Expressionist. Each was revolutionary for his time, and each was monumental. In various places I had seen and admired individual Smith pieces. The huge National Gallery exhibition allowed me to admire his work in depth. It was dramatic, beautiful, and exciting. Smith’s premature death robbed art of a powerful and compassionate champion.